ENJOY YOUR NEW LIFE STYLE!!! WALK TO BEACH, TRAIN, SHOPPING AND ALL THE GREAT RESTAURANTS BEVERLY HAS TO OFFER!!. Exquisite townhouse that shows the love and care the owners have put into this beautifully decorated unit. Main living level has updated kitchen with dining room and its own fireplace. Enjoy the summer months on your private deck overlooking beautiful common grounds. Living room with its own fireplace has cathedral ceiling with loft and beautiful wood beam and wood stair railings. Renovated half bath located off the living room. 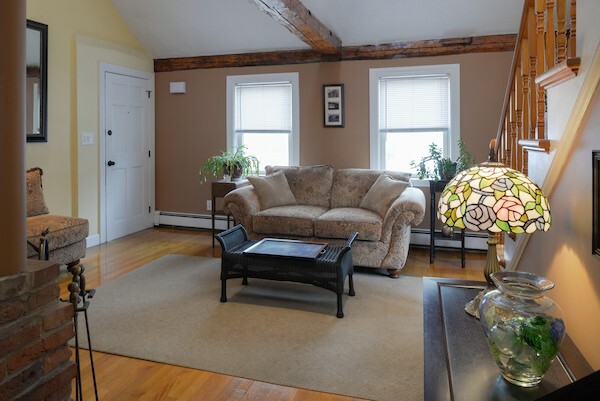 Second level offers a sky lighted loft area that could lend itself to tv area, office or sitting area. The full size bathroom has its own jacuzzi and nicely decorated. Large, skylighted master bedroom has built ins and a separate area for huge closet, office, or dressing area. New state of art gas heating system. Recently painted entry way gives warmth when entering the common area. EXCEPTIONAL UNIT! !